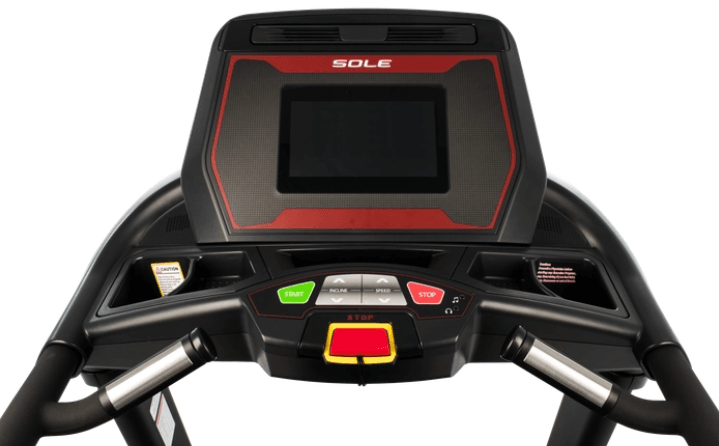 The SOLE TT9 treadmill is the latest treadmill offering from SOLE. This treadmill has some upgrades which other SOLE treadmills lack, such as a 450 lbs weight capacity, and a 10” touchscreen. However, the TT9 is priced very high for the few upgrades it offers. Based on the high cost for the features offered on the TT9, we would not recommend the TT9 unless you really need a residential treadmill with high weight capacity. The TT9 treadmill is regularly priced at $3,499. Need a high weight capacity treadmill - The TT9 is the highest weight capacity treadmill currently available through SOLE. Users up to 450 lbs can use this treadmill. Have plenty of space available - This treadmill is quite large and does not have the ability to fold up. Any users who buy it should keep its size in mind and ensure they have room for the TT9. Want a SOLE with more incline - Only the TT-series of the SOLE treadmills can decline to -6% and incline up to 15%. There were many excellent qualities built into the TT9 treadmill. However, there are some factors which dropped its rating. Very pricey residential treadmill - Generally, the SOLE treadmills are affordably priced but the TT9 is different. It is $1,000 more expensive than the next SOLE treadmill and far more expensive than competitor treadmills which have better features for a lower price. 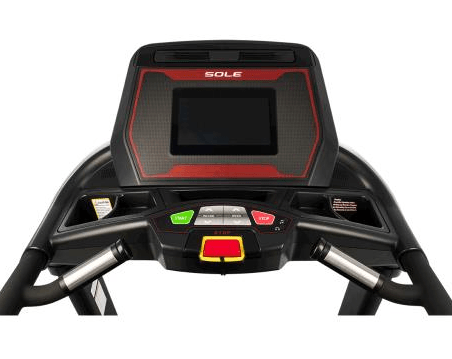 Excellent build quality - We already love SOLE treadmills for their excellent build quality and the TT9 has improved on that theme. This treadmill offers a wide base, thick metal side rails, longer console arms, and commercial-grade steel frame. Does not offer much more than TT8 - Unfortunately, the TT9 does not offer much more than the SOLE TT8, but it costs $1,000 more than the TT8. Though this treadmill has great qualities, the pricing and lack of definite upgrades definitely hurt its ranking on Treadmill Reviews. Motor Size - The motor in this treadmill is a 4.0 CHP, which is one of the largest treadmill motors available in residential treadmills. Running Area - The running area on the treadmill measures 22” wide and 60” long. This area gives plenty of room for tall runners to move and you don’t have to feel cramped. Weight Capacity - One of the best features of the TT9 is its high weight capacity. Users who weigh up to 450 lbs can safely use this treadmill. Folding - No folding feature comes with the TT9. Space / Footprint - This treadmill has relatively large measurements which are 36” wide, 84” long, and 58” tall. Max Speed - The top speed you can reach on the TT9 is 12 miles per hour (MPH). When you start the treadmill, the lowest speed it can go is 0.5 MPH. You can change the speeds either by whole integers or by 0.1 increments. Incline - This treadmill has an incline range of -6% to 15%. This treadmill moves smoothly as it transitions between the incline levels. Workout Apps - Like all SOLE treadmills, the TT9 only comes with 10 workout apps built into the treadmill. Two of the programs are custom, so users can create their own workouts, and there are two heart rate programs. Display - Unique among the SOLE treadmills, the TT9 has a touchscreen as its display. What is odd is that with the addition of the touchscreen, SOLE removed the easy speed and incline adjustment buttons. This change makes the TT9 a little less easy to use, even though the touchscreen is relatively responsive. Speakers - The speakers are of good quality with decent clarity until you reach the higher sound levels. Fans - Like other SOLE treadmills, the fans are located at the top of the treadmill console. The fan unit can be angled, but the airflow is not strong. Heart Rate Monitoring - There are two pulse grips where you can place your hands to monitor your heart rate. However, these grips are not overly accurate as it can be hard to take your pulse from your hands. You can purchase a wireless heart rate monitoring chest strap to use with the TT9. 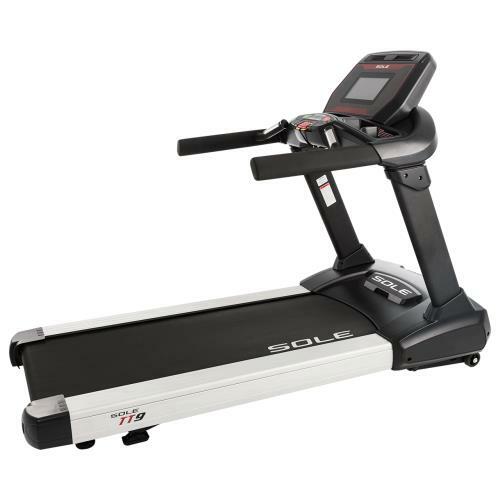 This treadmill does not come with a chest strap with your purchase, which is odd since the SOLE F85 comes with one and is much more affordable. One of the best features of any SOLE treadmill is its frame. 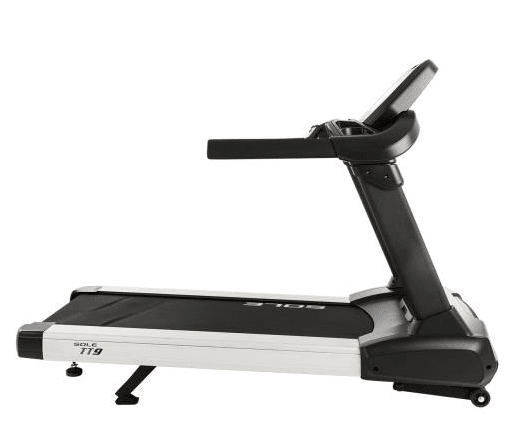 The TT9 has a commercial-grade steel frame, which is far thicker than any other SOLE treadmill frame. It is strong enough to support the activities of all users from casual walkers to elite runners. SOLE has slightly higher costs associated with returning their products. There is a 15% restocking fee, and freight charges which will be deducted from your return. These fees will be waived if you receive a defective or damaged machine. This treadmill is objectively a great treadmill. It has an incredibly sturdy frame, a responsive touchscreen, the ability to decline and incline, and a 4.0 CHP motor. However, the TT9 falls short when compared to competitor treadmills, especially because it cost so much more than other treadmills with excellent features. 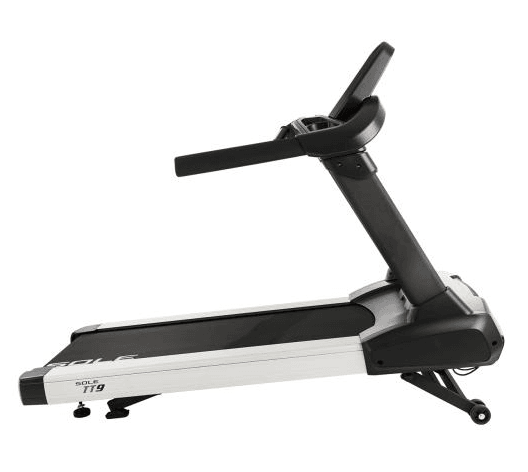 The NordicTrack X22i Incline Trainer cost $2,999, has an incline range of -6% to 40%, and has a 4.25 CHP motor. The ProForm Pro 9000 cost $1,999, has 40 workout apps available and comes with a Bluetooth heart rate monitor chest strap. To receive the best pricing and warranty fulfillment assurances, we recommend you purchase the TT9 from SOLE directly. This treadmill manufacturer offers free shipping, a 30-day trial period, and a guarantee covering any treadmill defects on arrival of the treadmill.